Continued from page 1. 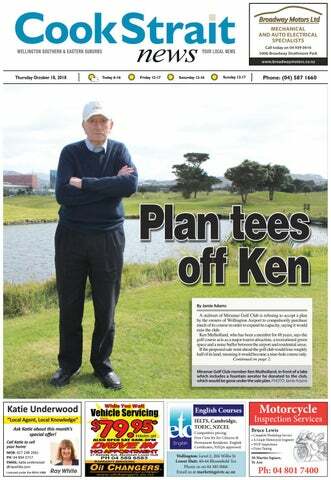 Ken has uploaded a petition to the NZ Parliament website calling for MPs to pass a law that would apply a “special heritage land designation on land owned by the Miramar Golf Club in Wellington to protect it from compulsory acquisition by Wellington Airport”. The petition currently has 98 signatures with 105 days left until it closes. “I’ve applied to have the site listed as a Heritage NZ site, but that would take two to three years for approval,” Ken says. The Miramar Golf Club is 113 years old and its 18-hole course has lain adjacent to Wellington Airport since its establishment in 1958. Wellington International Airport Ltd has given notice that the golf club land is needed to expand for future growth, including longer taxiways and accommodating more planes, especially if a controversial plan to extend the runway goes ahead. The golf club was told the company was able to compulsorily purchase the land under the Public Works Act. However Ken is sceptical about that right, given it is a profitmaking business. What Wellington Airport would look like after acquiring much of Miramar Golf Course, with a new holding bay and extended taxi-lanes. of interest. He says a LIM report would state the land is zoned for recreational use only. He says if the airport really needs to expand it should do so westwards into Rongotai, given it already owns some of the adjacent land and much of it isn’t residential. Members of the Strathmore Park Progressive Association have signed the petition but are realistic about the outcome, given it is private land. “If this goes ahead we want a bottom line of two-way access of Stewart Duff Drive and buffer zones to neighbouring houses,” secretary Glenn Kingston says. Good news for bus commuters - the Tramways Union has reached a provisional settlement with New Zealand Bus and it’s possible a planned strike will not go ahead next week. Tramways Union Secretary Kevin O’Sullivan says the settlement will be put to the union members for ratification tomorrow. He says the union negotiators will recommend that the “really good settlement” be accepted. “It gave us practically everything that we asked for.” Over the next two years the drivers will get a 4 per cent pay rise and an extra week’s holiday, a shift allowance and a bargaining process agreement. Furthermore, the union is using this settlement as the bottom line for any agreement with the other bus operators. NZ Bus is a small employer, while Tranzit operates more than 60 per cent of Wellington regional bus routes. Tranzit has asked that negotiations be reconvened and Kevin says if they agree to let their drivers attend the union’s stopwork meeting set for Friday it will suspend a planned strike on October 23. “If Tranzit signals that it will meet the baseline just established, the strike will be postponed while negotiations continue. They need to have time to have a think about it,” Kevin says. As of Wednesday afternoon there had not been any indication that Tranzit drivers would attend Friday’s meeting. The Tramways Union is seeking the same collective contracts for its Go Wellington drivers that have been ratified for Hutt Valley Flyer drivers. The Government is also weighing in. It has reconvened its committee on transport and infrastructure to meet on Thursday, October 25.
inbrief news Heritage buildings to be strengthened Heritage buildings in Wellington are receiving funding to help with earthquake strengthening, the Ministry for Culture and Heritage has announced. Heritage EQUIP funding totalling $852,000 has been awarded to the owners of four significant Wellington buildings. Ashleigh Court Newtown, a Heritage NZ Category 1 building, is receiving $184,000; 255 Cuba Street is allocated $31,000; the landmark Erskine Chapel of Island Bay, also a Category 1 building, receives $250,000 and the Farmers Building in Cuba Street receives $250,000. Heritage EQUIP provides private building owners with up to 50 per cent of the funding required for seismic strengthening of heritage listed buildings. Rugby Lions raise $7000 The Wellington Children’s Hospital will receive $7000 after a dedicated fundraising effort by the Wellington Lions squad. Each year the Wellington Lions Mitre 10 Cup squad forms four mini teams and are set challenges for the season. This season the players decided to try and raise money for the side’s charity partner, The Wellington Children’s Hospital, from an initial outlay of $200 That included running a number of raffles with the players coming up with their own prizes, including lunch with the squad at The Green Man. The winning mini team raised $3630. Toogood coming to Massey Musician Jon Toogood’s The Adults are the headline act for the VNZMA Artisan Awards to be hosted next month at Massey University Wellington’s School of Music and Creative Media Production. Five Tui awards will be presented at the event on Monday, November 5 that honours the creative talents working behind the scenes of the top New Zealand recordings of 2018. Awards will include Best Engineer, Best Producer and Best Album Cover, as well as the categories of NZ On Air Best Music Video and the new award for Music Teacher of the Year. inbrief news Cooler spring masks UV risk MetService is urging Kiwis to re-think their sun-exposure with the risk of damaging ultra-violet (UV) radiation climbing rapidly at this time of year. MetService meteorologist James Millward says UV radiation isn’t just a summertime concern. “Many people incorrectly believe that UV levels are related to temperature, which is a myth,” says James. “Cloudy days give people a false sense of security. A high percentage of UV gets through cloud.” The risk of UV damage exists for a high proportion of daylight hours whenever someone is outside and regardless of what they are doing. Single CEO for two DHBs Capital & Coast and Hutt Valley DHBs have voted to appoint a single chief executive officer to lead both DHBs in a move they say will better support health service planning and delivery across the Kapiti, Porirua, Wellington and Hutt Valley areas. The joint chief executive will support the DHBs to plan together on prevention and community-based care while also ensuring hospitals provide expert clinical care when people need them. There will now be an opportunity for staff and other stakeholders to engage in discussion about how best to ensure a smooth adjustment and transition to a single CEO model. Warning labels for pregnant women Pregnancy warning labels on alcohol will become mandatory in New Zealand, The decision was made at the Australia New Zealand Ministerial Forum on Food Regulation in Adelaide last week. “While the alcohol industry has been voluntarily including warnings on some products for the past six years there is no consistency in the type, colour, size and design, reducing the effectiveness of the message,” Minister for Food Safety Damien O’Connor says. The move brings New Zealand in line with other countries that legally require pregnancy warning labels on alcohol such as the US and France. the GWRC has damaged Wellington’s brand as the ‘coolest little capital’.” ReVolt is calling for the government to take immediate action, including passing legislation to introduce vehicle emissions standards to New Zealand, introducing on-board portable emissions testing for public transport to prevent the debasing of emission standard and holding an independent inquiry into the mishandling of Wellington’s bus network. St Thomas’ Chapel in Newtown is celebrating the 120th anniversary of its vintage pipe organ with a series of concerts. The oldest components of the organ were built in 1898 by the celebrated organ builder Arthur Hobday, who had set up business in Wellington in 1896 following a career in Australia, and who lived in Lawrence Street in Newtown until his death in 1912. Arthur built organs in many church buildings throughout New Zealand in the later years of the 19th and the first decade of the 20th centuries. Over the years further stops were added to increase the organ’s size and capability. In 1970 the original wooden St Thomas’ Church was fire-damaged beyond repair and demolished the following year. The organ was removed and put in storage until the completion of the current St Thomas’ Chapel in 1982, when half of the organ components were installed in St Thomas’ with a new manual (organ keyboard). The remaining organ pipes were installed as a new instrument in the former St Cuthbert’s Church in Berhampore. Organiser Richard Noble, an assistant priest at St Thomas’, says the visible pipes are merely decorative and the actual sound pipes are tucked behind them. “It’s a pre-cursor to the modern synthesiser. Each pipe comes with different sounds like drums and strings. There are also pedal keys that act as bass notes.” Following the August 2013 earthquake and prior to the subsequent deconsecration and demolition of St Cuthbert’s in 2015, the organ there was gifted to the Wellington Museum, where it is hoped it will eventually be displayed as a working exhibit. During Heritage Week, which begins on October 22, folk will be able to enjoy the sound of the Hobday organ at St Thomas’ Chapel in a series of half-hour lunchtime recitals. David Dobson, Ken Dougall and Jonathan Berkahn will perform from 12.30-1pm this coming Tuesday, Wednesday and Thursday respectively. They will be followed by an hour-long recital at 2pm on Saturday October 27, and then during the 9am worship service on Sunday. these areas by 2021, with the Council paying 25 per cent and NZTA paying 75 per cent,” he says. The Council is working towards an integrated plan for what it says is high-quality biking and walking connections from the south coast to the city – including the Island Bay improvements – for which it aims to achieve sign-off from NZTA by mid-2019. Councillors will consider the co-funding opportunity at the Council’s City Strategy Committee meeting today. If approved, it will affect when the redesign work in Island Bay will happen. However not everyone is happy with the announcement. On Friday Island Bay Residents Association president Vicki Greco announced the association had filed for a judicial review in the High Court and served the Council a notice of proceedings. The proceedings ask to quash the decision of September 27, 2017 to adopt the option it took, and it has also taken issue with the consultation process leading up to the decision. Improvements to the Island Bay cycleway are among the $24 million measures. readers have their say... Find out the WORD on the Street. Q: Do you support Wellington Airport’s proposal to expand into the Miramar Golf Course? Vicki Kennedy, Strathmore Park No. There’s not many places around the city where someone can play a game, not that I’m a golfer. I don’t think the airport needs to get bigger. Martin Loga, Miramar I don’t mind. It makes sense to me. It’s an international airport and it’s annoying if you have to catch two planes to go overseas. Flo Hatziloukas, Seatoun Heights I think we need to expand otherwise look at all the international flights that don’t come here. If Wellington is going to benefit from it, why not? Jane Broad, Strathmore Park Yeah. It’s a small airport. I can appreciate how people would be upset by it but there’s nowhere else to expand it. Bridie McDonald, Seatoun The concern I’d have is why the local developments haven’t had proper consultation. There’s always arguments for growth but it will have a huge impact. Julian Legge, Miramar If it was for the extension for the runway then I would be all for it. It would be a shame to get rid of green land for the sake of not much. L e t te r s on issu e s o f communit y interest are welcomed. Guidelines are that they should be no longer than 150 words. They must be signed and a street address provided to show good faith, even if a nom de plume is provided for publication. The editor reserves the right to abridge letters or withhold unsuitable letters from publication. Send or fax them to the address on page two, or email them to news@wsn.co.nz. Please note that your name and street address must also be provided in e mails. Diversity has wrecked the post-Christian western world Dear Editor; Anita Vogt ends her letter (CSN, October 11) by suggesting I might have an opinion on the relative importance of religion and culture, she herself desiring less of the former, and more of the latter. Yes, I have an opinion. First, it depends on which religion: all present faiths and non-faiths other than Christianity are false; and this includes many that pretend to be Christianity and to be the only true one. Perhaps some non-Christian religions and cultures include a modicum of wisdom; but they still all lead to eternal loss; and the Christian ethos and culture put them all in the shade, as well. While many wars have been started by religion, it isn’t true that all wars are. Neither of the two World Wars was; and WWII was started by irreligion. Nazism was atheistic, though getting a lot of help from pseudo-Christians who saw it as an ally against Communism. the band produces a funky, chill groove that isn’t limited to any particular genre. However, they create an atmospheric sound they say is sure to entice your ears. The band has a sound comparable to US musicians The Internet and Ravyn Lenae, but with notable differences. They describe their music as “sour but sweet, and extremely versatile”. James’s ever-changing synth patterns mixed with Amy’s vocal and tone range contribute to this versatility. Androgynous Lemon’s new single has been described as “ground-breaking” in the alternative genre. Ben Elisara of Coastal Promotions describes it as “a distinctive yet refreshing sound the New Zealand Music scene has not heard in decades”, while musician Solomon Crook loved the “quirkiness” of the “summery” Gold/Space Samba. The band says it is largely focused on crafting experimental music that is not exclusive to any type of listener or genre. Later this month the band will play at Massey Wellington’s R1 room, as well as in Eastbourne and Whanganui with other headlining band Electric Current. Selling your House? Employ me to help you sell it privately and save up to $16,000 on the sale of an average house. Offers end 29 October 2018, or while stocks last for wallpaper clearance deals. Not available in conjunction with any other offer or discount. *Tinting charges may apply. Excludes Berger® Gold Label® and Berger® Jet Dry®. ^Indent, nett priced and other selected wallpapers are excluded from this offer. Please ask in-store for details. ~ Selected ranges only. Offer applies to patterns that are currently in-stock with our NZ based supplier. Please ask in-store for details. Join Miramar Golf Club and you will find a vibrant golfing atmosphere exists among members and a warm welcome is extended to visitors. Why not have the best? We will make to measure, any wood, any colour. Unichem Kilbirnie Pharmacy opens its private carpark to all of its customers. Free to all our customers for the duration of the Bay Road closure. The time limit is 1.5 hours. Entrance is off the Countdown carpark. London, this Gala and Festival is truly international and I am incredibly proud to see the word is spreading that the NZIF is a high quality experience.” The annual New Zealand Improv Festival sees hordes of world-class improvisers from all around the country and the world take over Wellington for one week of made-up mayhem. There are no scripts, no lines to remember, only spontaneity and generosity on stage, creating theatre that has never been seen before and will never be seen again. The NZIF 10th birthday Gala kicks off on October 20 at 7.30pm - 9.30pm at Hannah Playhouse, 12 Cambridge Tce. The other 16 shows are happening at BATS Theatre. Go to nzimprovfestival. co.nz to find out more. Girls Years 1–13, Co-ed Preschool Come and tour the beautiful Marsden Karori campus and see us in action. We look forward to showing you around. Enrolments for 2020 and beyond open. Year 12 Wellington High School students Abishkar Palma, Theo Sutorius, Riley Gibson, Liberty Facebook Head of Global Safety McIntyre-Reet and Molly Doyle at the launch of the Sticks ’n Stones Online Advocates programme. Antigone Davis speaks at the PHOTOS: Jamie Adams launch. people from being themselves. Facebook’s Head of Global Safety Antigone Davis flew in from the US to attend the launch. She told the audience that young people are “at the forefront” of achieving Facebook’s aim of building community. “In order to do this you have to feel safe online, which means we have to invest in your online safety. one version of the city we live in – but through zines I get to see a whole different version. “For me they show you what’s going on in the minds of the people who live here. Reading a zine is like looking through someone else’s eyes for a minute or two - it’s pretty special.” Spaces for its 60 stallholders filled up almost instantly, he says, and roughly 1000 people are expected to traverse the market space just off Cuba Street. Liam says the Zinefest committee decided to hold the market at Te Auaha thanks to its central location, accessibility and creative vibes. Molly Doyle says a peer-to-peer network would be an effective way for students to communicate any issues they may be reluctant to talk about with their parents. Fellow WHS student Liberty McIntyre-Reet believes her school - which is notable for its inclusiveness - could lead the charge for creating positive environments, both on and offline, in all schools. Electric vehicles go the distance If you think you can’t go places in an electric vehicle, you’re wrong, according to latest data. The data from Flip the Fleet, a coalition of over 1150 EV owners nationwide, shows that electric vehicles are actually driven further each year than combustion vehicles. The annual average distance travelled across all models of EVs is 14,100km/year, a quarter more than the 11,500km/year for combustion vehicles. Kathryn Trounson, chairperson of environmental lobby group The Better New Zealand Trust, couldn’t be happier. “Our Trust provides test drives to let people experience what a joy EVs are to drive. These data show that the switch to electric cars also saves them money while reducing New Zealand’s carbon footprint,” Kathryn says. Even the very earliest Nissan Leaf model with a small battery is travelling more than the average for combustion vehicles, she says. The average single trip away from base and back again in a New Zealand EV is 48km, whereas the NZTA estimates that the combined distance of all the day’s trips in a combustion vehicle averages only 28km. “The data well and truly busts the myth that EVs aren’t a practical substitute for a conventional car,” Kathryn says. The sums in favour of an EV are getting even better with the recent petrol price hikes. Flip the Fleet estimates that a commuter doing a 100km round trip to work, five days a week, is saving $90 per week in fuel and maintenance costs. Flip the Fleet is a “citizen science project” that provides scientifically reliable information on the benefits and constraints of electric vehicles in New Zealand. Co-founder Dima Ivanov says there are currently 182 EV owners from Wellington who have signed up to Flip The Fleet, and this number has been steadily growing. “Wellington is second in our rank of cities with Flip The Fleet participants (Auckland is first with 323), so the uptake in your area seems really good, based purely on this one value.” Dima notes there have been “quite a few” sign-ups overall in the recent weeks, but could not specify if it was attributed to the price of petrol. Our Best Price Queen Size Bed. Bonnel spring mattress with solid pine base. Soft pillow top for superb sleeping comfort. Complete set includes 1x King Single frame with mattress & single metal trundler with mattress. Offers end 31/10/2018. *Finance Now lending criteria, fees, terms and conditions apply. Rate and fees are subject to change. See in store for more information. • Next steps and timeline for Judicial Review, now that we have filed in Court. live music and a kids disco. Bargain hunters will love the stalls crammed with books, toys, white elephant gear and clothing. Plus, new for 2018 is a specially built money booth with $1000 up for grabs! Follow the Island Bay School Fair 2018 event page on Facebook for updates. 3 November 11am - 2pm. Island Bay School, cnr Clyde & Thames St. If you wish to speak or have an agenda item please email. ADVERTISING TERMS & CONDITIONS All advertisements are subject to the approval of Wellington Suburban Newspapers. Advertisements are positioned entirely at the option of The Trades Services Publisher & no guarantee of placementand is given. Applicable loadings apply only to the specific placement of strip or island advertisements. Placement & approval is at the discretion of The Publisher. While every effort will be made to publish as instructed, The Publisher accepts no FOR ALL ELECTRICAL repairs and liability for any loss caused through loss or misplacement. The Publisher reserves the right to reject any advertisementby considered unsuitable for publication. Advertisements will bewith charged installations top-qualifi ed electrician on the size of the material supplied or the space ordered whichever is the greater. It is the responsibilityof of the Advertiserfiorfty Advertising Agent toof notifygiving Wellington Suburban Newspapers record over years locals the of any error within 24 hours of its publication. The Publisher is not responsible for recurring lowest costa classifi “around-the-clock” service, errors. To obtain ed space order (defined as annual commitment of advertisingjust space or spend) please speak to your advertising representative. (Surcharges may apply if commitphone orof 021-0717-674 or email ment levels977-8787 are not met or cancellation a space booking & or contract). Cancellation: neither display nor classified cancellations will be accepted after the booking deadline. No credits jack.powell@outlook.com will be issued to classified package buys that have commenced their series. If an advertiser at any time fails to supply copy within the deadline, it is understood & agreed that the last copy supplied will be repeated. Specific terms & conditions apply to certain classifications. These Situation Vacant may relate to either requirements & conditions set by industry standards for the advertising of certain goods & services, or set by The Publisher. Please speak to your advertising representative to obtain a full copy of these. Advertisers agree that all advertisements published by Wellington Suburban Newspapers may also appear on a relevant website. 51. J.K. Rowling 7.00pm chose the Monday 30th November unusual At the Clubrooms name ‘Hermione’ Corner of Main Road so young and Moohan Streets, Wainuiomata girls wouldn’t Some of the Houghton Valley pupils creating pom-pom garlands for their school’s be teased fair. From left, Isla Williams, Mattias Sprenger, Will Cleaver-Paris, Gus upcoming Cenac, Arif Mir and Ihika Tioki. PHOTO: Jamie AdamsBringing local news for being nerdy! to the community By Jamie Adams school to work on some of the crafts that will go on display for next Saturday’s Pupils at Houghton ValleySituation School Vacant event. have spent class time gearing up for the Many of the activities are based on the school’s annual fair later this month, with sustainable model as Karen aims to make sustainability being the overriding theme. the fair a “zero landfill” event. Co-ordinator Karen Parr says the fair “We will have a waste management copromises great entertainment, good ordinator to ensure that we cut out plastics food (including a South African-style and compost all the waste from our stalls. spit roast), cake stalls and a range of “The kids are making cloth bags for handcrafted items for sale. the fair and are reusing things to make Entertainment will include pony rides, crafts. They are also making sandwich sumo-suit wrestling, dog agility exercises bags from old T-shirts and wraps made and mini golf, with activities spilling on from beeswax. to neighbouring Sinclair Park. “We are offering visitors a free cup of tea Deliverers inbring their own reusable “It’s a big community fair. All theRequired at the fair if they parents and teachers contribute to it, along bags for their purchases, or bring their Area 1: community,” Momona, Mohaka, Kawatiri - Kaponga. with the wider Karen says. own cups. “It’s the main event of the year in “It’s a great message for them to learn Houghton Bay because there are no shops at a young age.” here. The school is our hub.” The Houghton Valley School Fair will Classes of older and younger pupils be held at 110 Houghton Bay Road from paired up during the accounts@wsn.co.nz first week back at 10am to 2pm on Saturday, October 27. PRIVATE & COMMERCIAL CLEANING & PROPERTY SERVICE 100% FAMILY OWNED AND OPERATED BUSINESS WITH YEARS OF EXPERIENCE!! Enrolment at Kilbirnie school is governed N by a scheme which is detailed on the school website. The Board of Trustees has determined that 5 places are available at the new entrant level only in term 1-2 in 2019. The exact number of places will depend on the number of applications received from students who live within the school’s home zone. Public Notices SECURE STORAGE 14sqm $42 per week. Capital Trout Centre Open Day 28 October Free tickets available from Steve’s Fishing Shop, Ghuznee Street and Hunting and Fishing. Alicetown. house plans. Free estimates provided. Call Doug on 934-1398. BUILDERS AVAILABLE LBP. Residential & Commercial buildings and maintenance work. Quality assured. Taking bookings for 2019. Phone: Shane - 021987752. TIRED OF THE BUS fiasco? Sick of Uber? Try local rideshare ZOOMY - 100% NZ owned - use promo code ZOOMYJOHN for $10 off your first ride! Download the Zoomy app now use ZOOMYJOHN for $10 credit (expires 31 Dec). If you’re interested in supporting people to develop self-conﬁdence and independence, and live their lives of choice, lives like any other, in their own communities, then we want to hear from you today! Island Bay After School Care is looking for someone new to join our team. This is both for our Before and After School Care programmes which operate out of two separate venues. This position is open to one or two separate people. Before School Care is one hour per morning on 2 or 3 mornings each week. After School Care is for 1 or 2 afternoons each week for 2 or 3 hours each time. Ideally you would live in Island Bay or very close. We want someone who is URL read by:_______________________________ With: Date:_______________________________ tested: kind and caring and can bring fun_______________________________ ideas to our programmes. Someone with arts and crafts experience would be ideal. For more details, please phone our supervisor on 0274575359.
with their personal cares, such as bathing, dressing and toileting The ideal candidate will have: • The commitment to achieve a Community Support Worker Level Three qualiﬁcation • Experience supporting people with disabilities and/or challenging behaviours • Reliability, Commitment, and Passion for working with people • A full New Zealand driver’s licence • The ability and conﬁdence to drive a van with a manual transmission • A relevant qualiﬁcation • The ability to use a computer effectively, including programs such as Word, Internet Explorer, and email Apply Now if you have a passion for working with people and want to make a difference! Apply by visiting our career site https://careers.spectrumcare.org.nz and entering job reference – 11523. Applicants must be available to attend our Assessment Centre on Thursday the 15th of November. Spectrum Care is proudly an equal opportunity employer. the game behind the NRL and State of Origin. This Kiwis’ performance should be the blueprint going forward. H istor ica lly, t he typica l Kiwi effort was punctuated by an emotional national anthem, stirring haka, physical first 30 minutes before they rolled over in the final 50 minutes to lose by 30 points at the final whistle. The 2018 version saw them soak up pressure throughout, complete their sets and pile pressure on the highly-fancied Australians who wilted under the scrutiny. Only two late tries from the men in green and gold made the final moments interesting as the Kiwis had shown their superiority throughout much of the match. These early signs are promising. Like all things about top flight league in New Zealand, whether it be Warriors or Kiwis, consistency is key. Is this a f lash in the pan performance or is this the rebuild a fter the K idwell disaster? Only time will tell. SPORTS TRUST SPONSORED BY MIRAMAR & KILBIRNIE THE EASTERN SUBURBS SPORTS TRUST HAS GRANTED $4,440 IN SEPTEMBER 2018 TO EASTERN SUBURBS SPORTS TEAMS AND INDIVIDUALS, KINDERGARTENS, SCHOOLS, COLLEGES AND SPORTS CLUBS ETC. Firm feel. Features Torquezone® - 3 zoned design for support and durability. Features Latex Gold® and Dreamfoam®. omfort layers that workprovides added support and luxurious comfort. most. DreamfoamGel AVAILABLE FOR A LIMITED TIME. ogether with the ensorzone® core o reduce pressure WAS $6,799 points and improve irculation. • Silverline infused bambooCHIROPRACTIC fabric WAS $4,499 for natural Brighton health benefits. Dry-Tech ech Fibre which keeps your body at optimum temperature. Endorsed by the New Zealand Chiropractors’ Association for excellence in postural design. • Firm feel. • Great space saver perfect for kids or spare rooms. • Firm feel. • King• single full length Great space saver perfect for mattress with kids or spare rooms. additional single %• King single full length OFF mattress with trundler mattress, additional single ideal for sleepovers trundler mattress, or guests. ideal for sleepovers or guests. Medium feel. eatures Latex Gold® and Dreamfoam®. dzoned Swisstek ocket Spring. lverline infused amboo fabric or natural ealth benefits. • Firm feel. • Features Latex Gold® and Dreamfoam®. • 7 zoned Swisstek Pocket Spring. • Silverline infused • Firm fabric feel. bamboo • Features Latex Gold® and Dreamfoam®. for natural • 7 zoned Swisstek Pocket healthSpring. benefits. *Offer valid 13/06/2016 to 10/07/2016 or while stocks last. Excludes Everyday Dream Prices *Offer valid 13/06/2016 to 10/07/2016 or while stocks last. Excludes Everyday Dream Prices and clearance stock. Minimum spend $999. Lending criteria, $50 Annual Account fee, and clearance stock. Minimum $999. Lendingapply. criteria, $50 Annual Establishment fee,spend terms and conditions See counter for fullAccount terms andfee, conditions. Establishment fee, terms and conditions apply. See counter for full terms and conditions.